Not to be confused with the feldspathic igneous intrusive rock Monzonite. The elements in parentheses are listed in the order of their relative proportion within the mineral: lanthanum is the most common rare earth element in monazite-(La), and so forth. Silica (SiO2) is present in trace amounts, as well as small amounts of uranium and thorium. Due to the alpha decay of thorium and uranium, monazite contains a significant amount of helium, which can be extracted by heating. Monazite is an important ore for thorium, lanthanum, and cerium. It is often found in placer deposits. India, Madagascar, and South Africa have large deposits of monazite sands. The deposits in India are particularly rich in monazite. Monazite is radioactive due to the presence of thorium and, less commonly, uranium. Because of its radioactive nature, monazite is used for monazite geochronology to study geological events, such as crystallization, heating, or deformation of the rocks containing monazite. The name monazite comes from the Greek μονάζειν (to be solitary), via German Monazit, in allusion to its isolated crystals. Structure of monazite. Color scheme: red = oxide, pale blue = P, dark gray = Ce(III) and other lanthanides and actinides. All monazites adopt the same structure, meaning that the connectivity of the atoms is very similar to other compounds of the type M(III)PO4. The M(III) centers have a distorted coordination sphere being surrounded by eight oxides with M-O distances around 2.6 Å in length. The phosphate anion is tetrahedral, as usual. The same structural motif is observed for lead chromate (PbCrO4). Monazite sand from Brazil was first noticed in sand carried in ship's ballast by Carl Auer von Welsbach in the 1880s. Von Welsbach was looking for thorium for his newly invented incandescent mantles. Monazite sand was quickly adopted as the thorium source and became the foundation of the rare earth industry. Monazite sand was also briefly mined in North Carolina, but, shortly thereafter, extensive deposits in southern India were found. Brazilian and Indian monazite dominated the industry before World War II, after which major mining activity transferred to South Africa and Bolivia. There are also large monazite deposits in Australia. Monazite was the only significant source of commercial lanthanides but concern over the disposal of the radioactive daughter products of thorium, bastnäsite came to displace monazite in the production of lanthanides in the 1960s due to its much lower thorium content. 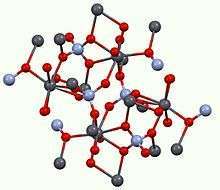 Any future increase in interest in thorium for nuclear energy will bring monazite back into commercial use. Because of their high density, monazite minerals will concentrate in alluvial sands when released by the weathering of pegmatites. These so-called placer deposits are often beach or fossil beach sands and contain other heavy minerals of commercial interest such as zircon and ilmenite. Monazite can be isolated as a nearly pure concentrate by the use of gravity, magnetic, and electrostatic separation. Monazite sand deposits are inevitably of the monazite-(Ce) composition. Typically, the lanthanides in such monazites contain about 45–48% cerium, about 24% lanthanum, about 17% neodymium, about 5% praseodymium, and minor quantities of samarium, gadolinium, and yttrium. Europium concentrations tend to be low, about 0.05%. South African "rock" monazite, from Steenkampskraal, was processed in the 1950s and early 1960s by the Lindsay Chemical Division of American Potash and Chemical Corporation, at the time the largest producer of lanthanides in the world. Steenkampskraal monazite provided a supply of the complete set of lanthanides. Very low concentrations of the heaviest lanthanides in monazite justified the term "rare" earth for these elements, with prices to match. Thorium content of monazite is variable and sometimes can be up to 20–30%. Monazite from certain carbonatites or from Bolivian tin ore veins is essentially thorium-free. 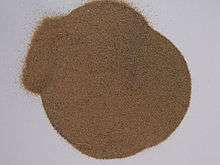 However, commercial monazite sands typically contain between 6 and 12% thorium oxide. The original process for "cracking" monazite so as to extract the thorium and lanthanide content was to heat it with concentrated sulfuric acid to temperatures between 120 and 150 °C for several hours. Variations in the ratio of acid to ore, the extent of heating, and the extent to which water was added afterwards led to several different processes to separate thorium from the lanthanides. One of the processes caused the thorium to precipitate out as a phosphate or pyrophosphate in crude form, leaving a solution of lanthanide sulfates from which the lanthanides could be easily precipitated as a double sodium sulfate. The acid methods led to the generation of considerable acid waste, and loss of the phosphate content of the ore.
A more recent process uses hot sodium hydroxide solution (73%) at about 140 °C. 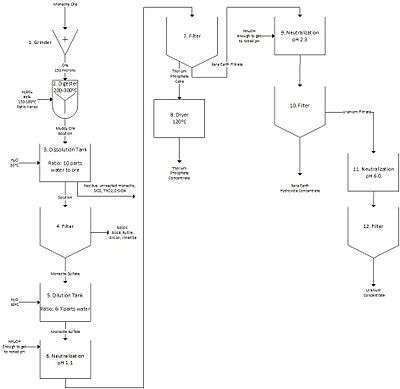 This process allows the valuable phosphate content of the ore to be recovered as crystalline trisodium phosphate. The lanthanide/thorium hydroxide mixture can be treated with hydrochloric acid to provide a solution of lanthanide chlorides, and an insoluble sludge of the less-basic thorium hydroxide. The following steps detail the extraction of rare earth metals from monazite ore. The process requires many neutralizations and filtrations. Grinder: Grind monazite ore to ~150 micron. Monazite ore contains 55-60% rare earth metal oxides along with 24 to 29% P2O5, 5 to 10% ThO2, and 0.2 to 0.4% U3O8. Digestion: Crushed monazite is mixed with highly concentrated sulfuric acid (93% acid) at feed temperatures of 150 to 180 °C. The ratio of acid to ore varies depending on the concentration of the ore (unable to find ratio range). The digester is stirred vigorously with a robust agitator and operates at temperatures between 200 to 300 °C. Acid is charged into the reactor and heated before the ore. The insoluble product coats the grains of crushed ore. The temperature in the reactor rises due to heat released from the exothermic reactions. After ~15 minutes, the viscosity of the solution has increased and the solution is similar to a dough. The product reacts for 3 to 4 hours. It is then removed from the digester before the solution hardens. The ratio of sulfuric acid to sand removed is 1.6 to 2.5. Dissolution: The contents of the reactor are cooled to 70 °C and leached with 30 °C water. A ratio of 10 parts water to mass of ore originally added is used. This leaching process continues for 12 to 15 hours. Filtration: All solids from step three are filtered off. Such solids include: silica, rutile, zircon, ilmenite, and undigested monazite residues. The resulting solution is called monazite sulfate. Dilution: Diluted the monazite sulfate with 6-7 parts water at 30 °C. Neutralization: Add NH4OH to neutralize to a pH of 1.1 to form a selective precipitate of thorium phosphate cake. Filtration: Collect thorium phosphate precipitate during filtration of neutralized monazite solution. Dryer: Feed thorium phosphate cake through a dryer at ~120 °C to create concentrated thorium phosphate. Neutralization: Add NH4OH to remaining monazite solution to create rare earth metal precipitate at a pH of 2.3. Filtration: Filtrate out the RE precipitate to yield the concentrated rare earth metal hydroxides. Neutralization: Add NH4OH to remaining filtrate to a pH of 6. This creates a uranium concentrated precipitate. Filtration: Filter remaining solution to yield uranium concentrate. The final products yielded for this process are thorium phosphate concentrate, RE hydroxides, and uranium concentrate. ↑ McGill, Ian (2005) "Rare Earth Elements" in Ullmann's Encyclopedia of Industrial Chemistry, Wiley-VCH, Weinheim. doi:10.1002/14356007.a22_607. ↑ Quareni, S.; de Pieri, R. "A three-dimensional refinement of the structure of crocoite, PbCrO4" Acta Crystallographica 1965, volume 19, p287-p289. ↑ Gupta, C. K. and T. K. Mukherjee. Hydrometallurgy in Extraction Processes. Boca Raton, FL: CRC, 1990. Print. ↑ Gupta, C.K, and N. Krishnamurthy. Extraction Metallurgy of Rare Earths. Boca Raton, FL: CRC, 2005. Print. Gupta, C. K., and T. K. Mukherjee. Hydrometallurgy in Extraction Processes. Boca Raton, FL: CRC Press, 1990. Print. Wikimedia Commons has media related to Monazite. radiation (in) paradise - the secret of the sand on YouTube; the third in a series of videos about a Monazite beach in Brazil.